A while back I asked you – my readers for Drupal blog recommendations. I was just getting started and I am still learning the inner workings of this excellent open source CMS. 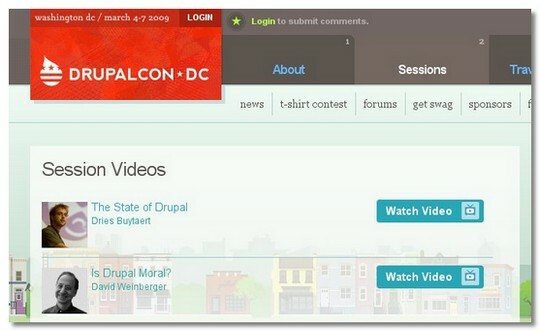 Recently I stumbled across the DrupalCon DC Website. It is the official website for the Drupal Conference held in Washington DC in March. Now that the conference is over, the website has now been transformed into a goldmine of Drupal information. Videos of more than 100 presentations are now freely available in this website. The sessions were given by Drupal experts on various aspects of Drupal in the conference. Even though I have been using this site for weeks, my aha moment to post about it here came when I saw a mention of it in the official Drupal blog this morning. A lot of these videos gave me really good insights into parts of the Drupal that would have taken me weeks to gather from reading the manuals. Plus, I learn the best by examples so sessions like these and pieces of code from blog tutorials are what I like the best. Plus, imagine having access to every session from this popular conference that you can now view from the comfort of your desk! If you are just starting to work with Drupal, give yourself some time to learn the ropes. It opens up a lot of possibilities with Drupal.